When you travel long distances we want to provide you with an excel calculation spreadsheet that give you the optimal speed you should travel in comparison to the total time to be traveled during one day. If you stay over night then you just have to observe the remaining reach with the remaining distance to final destination. At the overnight location you for sure should have a charging station. If you have to charge during the trip then you can use the spreadsheet. How to use the calculation spreadsheet? Use the spreadsheet and enter in the yellow fields. After the entries check the green section in hours. Now you can decide if you want to drive longer and wait shorter or the other way around. At charge type 4 and above you might already maximum speed possible on US highways. Please consider that sometimes a scenic road might be longer, but the elevation climb is lower as on an interstate highways. If you decide anyway to drive slower you can also this non interstate highway. This is for example the case between Phoenix and San Diego. Download the spreadsheet by click in the link below. 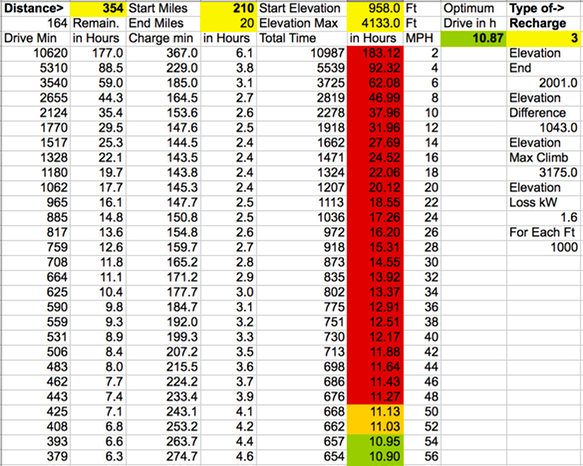 The calculation of the Model S is more based on an estimate.